When I was about six years old I didn't mind so much. Nor did it bother me when I was seven or eight as mum would treat me very differently when I'm a 'girl'. 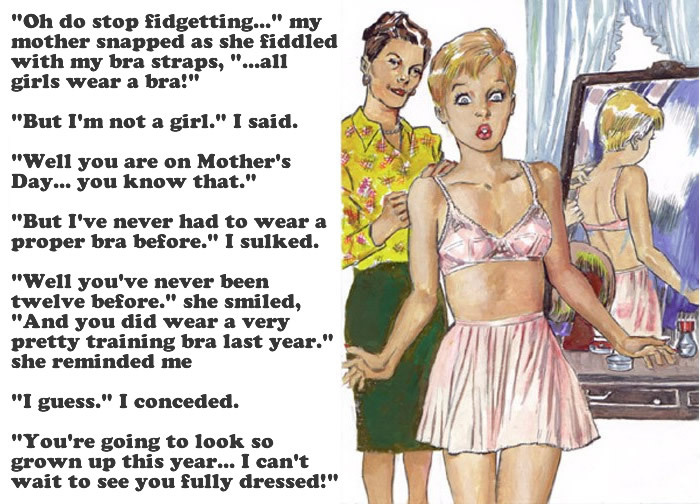 I used to love all the attention my mother gave me when I wore the short pretty dresses she'd brought me. But now I'm twelve I'm far less enthusiastic. There's a section of my mother's wardrobe where she keeps all of my Mother's Day dresses; currently it's home to six monstrosities in yellow gingham, pink satin, lilac, blue, peach and plum. The styles change little but the sizes do. A couple of the girl's in my class live on my street and occasionally I see them wearing their Sunday best; mostly plainish pretty frocks which are perfectly suited to girls aged twelve to thirteen. Mine however are always prissy and sissy, frilly and fussy with big bows and ribbons, a world away from anything a real twelve year old girl would choose to wear. In previous years' mum just put me in a dress and a pair of girl's shoes. Of course I wore girl's underwear too, but nothing like this! This year she's bought me a baby pink padded bra, matching knickers, an underskirt and a camisole to wear. I questioned why I had to wear 'all this stuff' and mum said it was because I'm 'a big girl now'. Every time I told my mum it felt too weird, having no hair on my legs, wearing make up and a proper girl's bra, she said “Well you're a big girl now Peter and big girl's don't have hairy legs do they?” amongst a number of other excuses. As usual, I went along with it. In spite of being massively humiliating, all I had to do was spend the day dressed as a girl whilst my mother and granny told me how pretty I looked and how nice I would have been if only I'd been born a girl. This year mum hasn't bought me a party dress. Instead I’ve got a short pleated skirt and a frilly sheer blouse. In theory a skirt and blouse is far more preferable to a little girl's party dress, but it being a baby pink blouse with plenty of frilly embellishments, coupled with a burgundy pleated skirt and a baby pink petticoat... it's by far the most horrendous outfit I’ve ever seen... or worn. I'm not sure who the artist is but I'm sure they are from Carole Jean's "Art of Petticoat Punushment" website. Oh nice story! Fantastic story that I wish had happened to me when I was that age.